Before the show last night the band met with Hanim, widow of Fehmi Tosun, an ethnic Kurd who was taken into custody in 1995 on his way to work and never seen again. Fehmi's plight was highlighted by the band on 1997's 'Pop' and last night, joined onstage by Turkish singer Zulfu Livaneli, they performed 'Mothers of the Disappeared' in tribute. 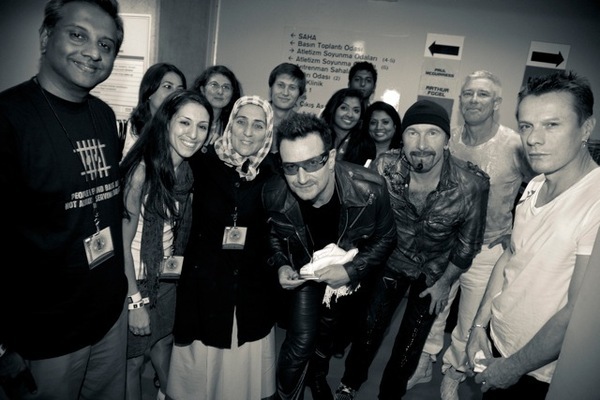 The song was originally inspired by a trip to El Salvador where Bono met mothers of people who had been 'disappeared'. Hanim and her own children are still fighting for Fehmi's legacy. Also joining Hanim and the band is Salil Shetty, the new Secretary General of Amnesty International.